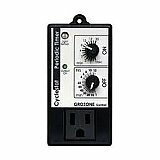 Controls cooling or heating equipment according to a daytime or nighttime set-point. Can power 120Vac equipment up to 15 amp. Typical control differential stands between 4° and 7°F / 2° and 4°C. 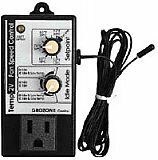 Controls any 120Vac equipment such as pumps or fans on a periodic repeat cycle. The ON duration spans from 10 sec to 20 minutes. The OFF duration spans from 1 minutes to 12 hours. The unit can function day and night or during day time only. This easy to use CO2 controller determines precisely when to activate and shut-off CO2 generators to maintain user-defined LOW and HIGH CO2 values in the grow room. The unit can deactivate CO2 enrichment during the night cycle and perform CO2 evacuation as well. The CO2 sensor is located in the controller box. -Automatically slows down or speeds up centrifugal fans to respect user selected temperature setpoints. -Enables the user to select the minimum fan speed (Idle Speed) between 25% and 60% of full power in 5% steps. -Enables the user to activate / deactivate the Low Temperature Emergency Stop during the day only, during the night only or at all times. 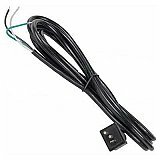 -6 foot cord with temperature sensor precise to 2°F / 1°C. -Can drive single phase 120 Vac induction motor type fans up to 750 Watts. -Any forced ventilation rooms should be equipped with this type of control to promote faster and more vigorous growth. 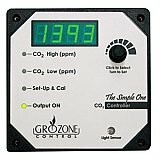 Grozone HT2 Digital Humidity & Temperature Controller with Photocell and Display. 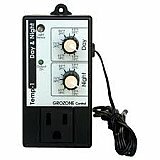 Grozone HT2 Digital Humidity & Temperature Controller with Photocell and Display. DESCRIPTION Day and Night temperature settings: 48?F to 104?F (9?C to 40?C). Day and Night humidity settings: 10% to 100% User can select one among five operating modes: Cooling, Cooling & Dehumidifying, Dehumidifying, Humidifying, Heating. User-Set Low-Temperature Limit (for Cooling & Dehum. mode only).. Remote Sensor w/ 25-ft cable (included). Bargraph display. 15 Amps Output. INCLUDED MODULES AND ACCESSORIES One plug-in type module. One Sensor. One 25-ft cable. One user guide. One screw kit . Controls cooling or heating equipment according to a setpoint and an adjustable differential from 4° to 20°F / 2° to 11°C. 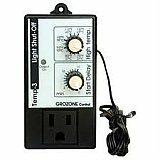 Automatically shuts down lighting and/or other equipment when a high temperature setpoint is reached. Once turned-off, the unit will run a user selected delay from 0 to 30 minutes before turning back on or will hold restart until manual reset (temperature setback of 5° or 10° F / 3° to 5°C). 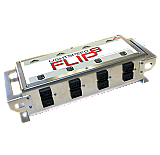 To be used in conjunction with 120Vac triggered high-load or light switcher like the LS1, LS2 or LS3. The Woodpecker dripper is the standard labyrinth dripper from Netafim. The delivery of the Woodpecker is very uniform with a practically constant pressure. The water delivery can be adapted to the irrigation requirements by varying the pressure. The patented Netafim labyrinth ensures maximum turbulence. The inlet filter and the large passages ensure outstanding protection against clogging. These high quality pumps are perfect for anything from aquariums to hydroponic systems. feature an environmentally friendly, oil free, high magnetic rotor for maximum power and a pre-installed removable foam filter which protects the impeller from damage by stray particles.